UK forces are to train troops for a peacekeeping operation in the Democratic Republic of Congo. Around 20 soldiers based in Northern Ireland will be deployed to Malawi to lead the training operation ahead of the deployment of international troops to DR Congo. Malawi Defence Forces are hoping to take control of parts of the country. The UN has sanctioned operations to dislodge Rwandan rebels in the east. 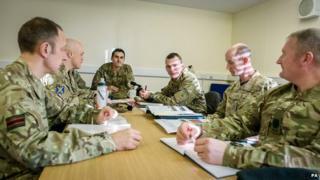 The UK soldiers, from the Royal Scots Borderers 1st Batallion The Royal Regiment of Scotland and the Second Battalion the Rifles, will spend two months in Africa, the Ministry of Defence said. The UN peacekeeping mission in DR Congo is one of the world's largest and most expensive. It includes uniformed staff from Malawi, South Africa and Tanzania. This is a small deployment of troops to Malawi. But it's a reflection of what the British army will be doing more of. There's little political appetite for large scale military interventions after Iraq and Afghanistan. Small teams of British soldiers are also training in some of the world's most volatile countries including Nigeria, Somalia and most recently Iraq. This "defence engagement" is increasingly part of the job description for the modern soldier; helping others to protect themselves rather than just doing it for them. And most of it will happen in the region rather than the UK. Not least because of the Army's bitter experience of training Libyan recruits at Bassingbourn. Maj Alasdair Hempenstall from the Royal Scots Borderers said: "We will be working in difficult terrain and to a tight schedule with a vast amount of operational expertise to pass over. "The Malawian soldiers are well organised and highly trained and keen to play their role in bringing peace across the Democratic Republic of Congo." Eastern DR Congo has seen guerrilla-style combat since 1994, when Rwanda's genocide spilled over the border. The Democratic Forces for the Liberation of Rwanda (FDLR) has been operating in DR Congo since then. The FDLR failed to meet a 2 January deadline set by the UN to disarm. Some of the group's commanders are wanted by the International Criminal Court for war crimes.